The RAB Trust offered me a work experience for five days with Iris Carr. I was very excited about that and was really looking forward to it. 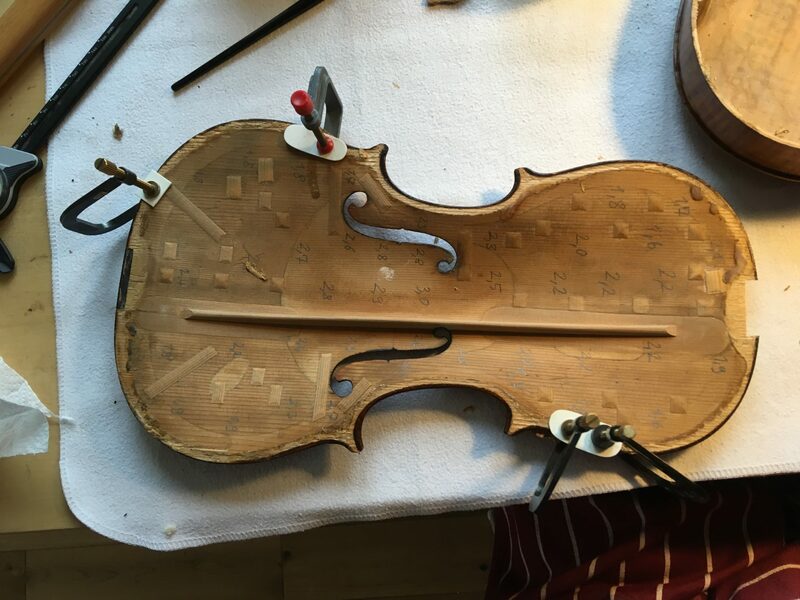 After having been welcomed with a big smile and a cup of coffee, I got given a Cassini violin that needed to have the top removed. What an exciting start to the week! I then spend quite some time regluing splinters back, but Iris showed me new methods to dissolve glue which was very helpful. I had also brought a restoration project that still needed a corner replacement and a neck graft. 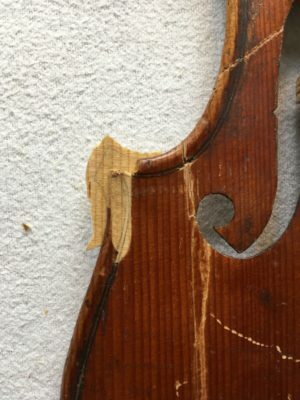 We discussed what to look out for when fitting a neck graft, how to measure it out properly and devised a plan for replacing the missing corner. Unfortunately, I did not manage to finish the corner by the end of the week but now I have at least an idea how to proceed and I learnt a lot about selecting and matching wood on the way. Iris also showed me how she retouches peg bushings and cracks and how she uses scrapers to recreate the surface. She took me through the whole process and I was amazed by how dry the brushes must be when you apply the varnish. I found it extremely helpful to be able to just sit and watch those peg bushings disappear. 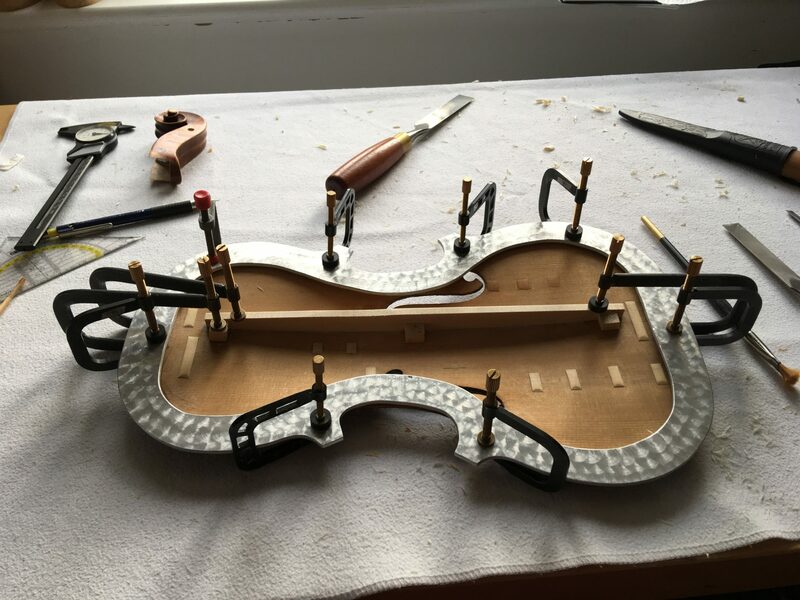 I also got to fit a bass bar on a violin and Iris explained me how she learnt to fit it which made it quite efficient so that I also had time to fit studs and find out when and where to place them. I had an amazing time with Iris, not just because she is super nice and helpful but also because I got an idea of what the daily work of a professional restorer is like. It also showed me how important it is to share ideas with colleagues because there are still new techniques being discovered. My stay with her inspired me very much and I would love to pursue this beautiful art in the future. I am very grateful to the RAB Trust for giving me this opportunity and of course to Iris for hosting me in her workshop!